Britt was already over at the house working on some other fun things we have coming up in the new year. It quickly went from a computer day to a day that would take my kitchen countertops days and a half a dozen wipe downs to recover from. I had been thinking about this cake for awhile. 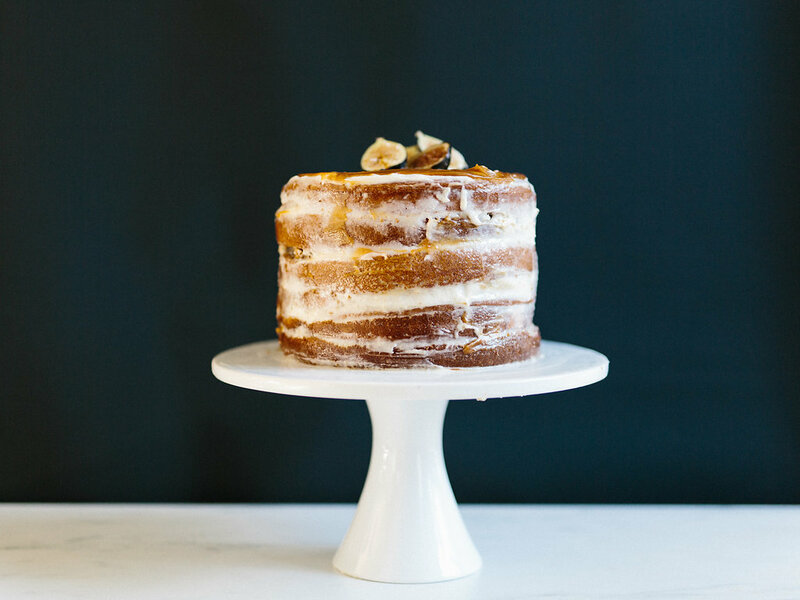 Thanksgiving is such a pie holiday and I do happen to be in the pro-pie camp, but when I imagine a festive dessert bar for the holiday it feels like it needs a centerpiece like this one– a six tiered Pumpkin Spice layer cake drizzled with salted caramel and figs. Cakes can be so intimidating, but not those of the naked variety. The cake was a breeze and we all devoured the rounded top pieces that we sliced off before stacking. The icing was another story. It took more icing than we planned so we thinned it to stretch it which basically ruined it so we scraped the icing off, considered sliding the whole thing into the trash, but instead went back to the pantry, grabbed some cream cheese and ended up with this beauty. Want to make a big impression without a lot of work? This cake is your friend! Preheat the oven to 350° and grease three 8-inch round cake tins. Whisk together the pumpkin puree, oil, eggs and sugar in a large bowl until smooth. Sift together the flour, baking powder, baking soda, spices and salt. Combine the dry and wet ingredients and fold together until smooth. Divide the mixture between the prepared tins. Bake for about 20-25 minutes until a skewer inserted into the center comes out clean. Allow to cool for 20 minutes. While the cake cools, make icing by whisking together cream cheese, butter and vanilla until creamy. Gradually add powdered sugar and stir together. If you need to thin the icing, add milk or almond milk. Just be sure not to get it too thin. Remove cakes from their tins onto a cutting board. 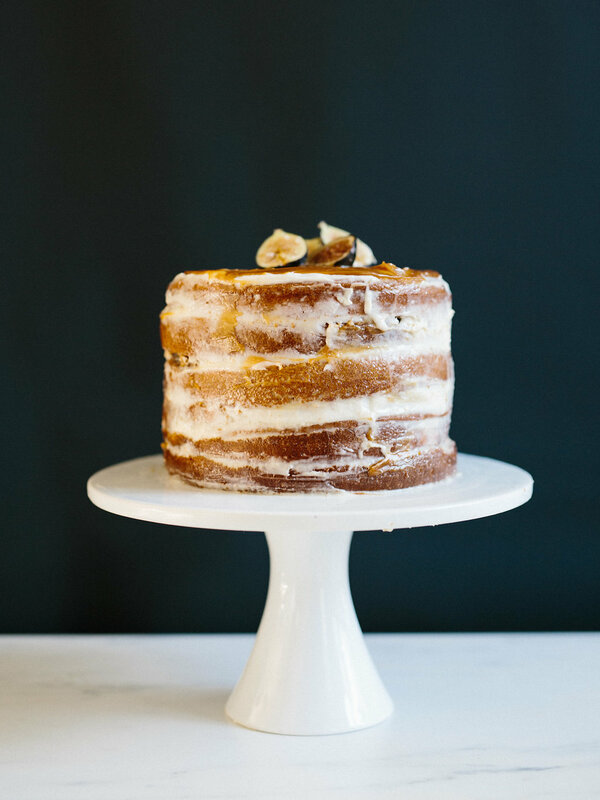 Carefully remove the rounded top portion of the cake with a bread knife so that each side of the cake is flat. Then carefully cut each cake in half across the middle so that you are left with six thin cakes. 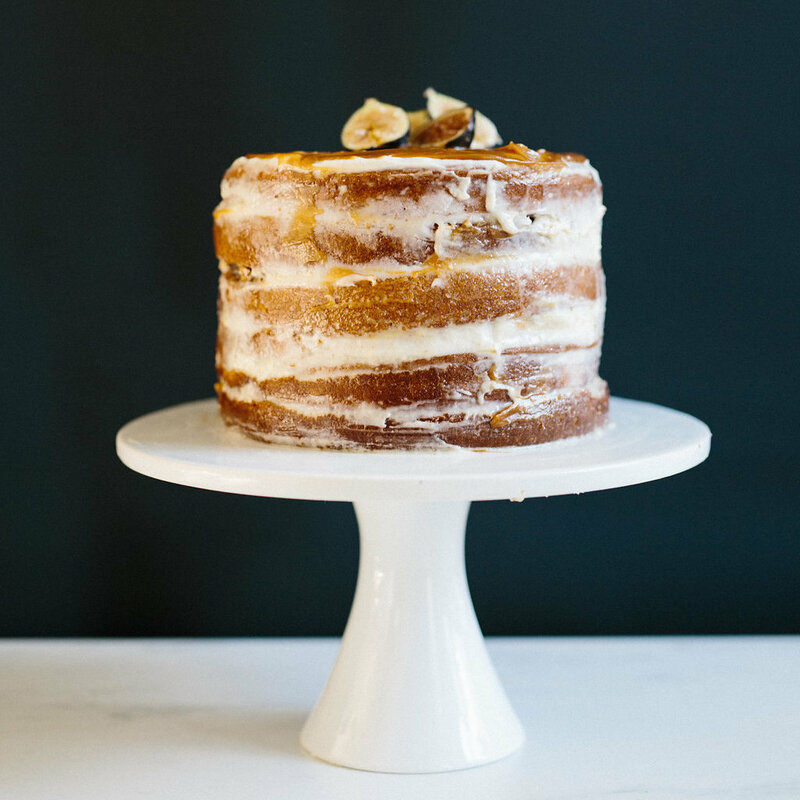 Carefully stack each cake on a cake stand with a thin layer of icing between it, allowing some too spill down the sides. Top with extra icing. Using a spatula, smooth the icing on the sides and top with salted caramel sauce and figs.